Su’ad Abdul Khabeer, Zain Alam, Yunique A. Saafir, and Muna Mire investigate the ways young Muslims fight state power. Through our YouTube channel, AAWW TV, you can relive the magic of live events at our space in Chelsea, check out in-depth interviews with writers, and more. Every Thursday we’ll be sharing a new segment from AAWW TV on The Margins. Watch for a special night investigating how young Muslim Americans resist empire through hip hop and other musical subcultures. 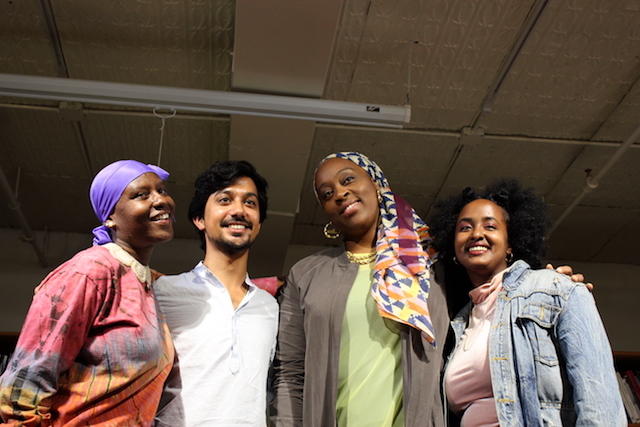 Su’ad Abdul Khabeer calls it “Muslim Cool”—her term for how young Muslims in the United States fight state power by engaging with Black identity, particularly through fashion and music. In a time when Black Muslims face both Islamophobia and anti-blackness, her work represents a vital intervention. Zain Alam, the lead singer of the band Humeysha, loops samples of North Indian soundscapes with lyrics that shift between English, Hindi, and Urdu to imagine a new Muslim sonic culture, inspired equally by My Bloody Valentine and J Dilla. Visual artist Yunique A. Saafir, who was featured in the Queer Muslim Photo Project, will present a life narrative about coming into her faith. They’ll speak with the Canadian Somali writer Muna Mire, a contributor to The New Inquiry, Vice, and The New York Times Magazine. Subscribe to our YouTube channel for weekly videos featuring our favorite Asian American authors. AAWW 's YouTube channel features edited clips from live events, in-depth interviews with our favorite writers, and more.